Making his way through Sherwood Forest, Robin is attacked and robbed. But the sight of Robin’s ring is enough to make one of the robbers stop and think. After bathing Robin’s wounds, he tells him his name – Will Scarlett (Miles Anderson). It’s interesting that Scarlett and his friends aren’t actually outlaws. Although they’re happy to waylay and rob any likely traveller, at this time they’re still free men. They’ve suffered under the rule of the Abbot of Grantham (David Ryall) though. The Abbot has controlled the Huntingdon estates for the last twenty years, bleeding them dry, as well as extracting bitter revenge on any malefactors. Once such is Ralph Gammon (Stephen Whitaker) who had one of his hands cut off for stealing. The character of the Abbot is a familiar one from many versions of the Robin Hood tales – he’s far from a holy, pious man of god – instead, he takes pleasure in the finest clothes, food and wine (whilst many around him starve). Before he left the Huntingdon estates he stripped them bare, but Robin, together with Will and Ralph, are able to restore what the Abbot stole. They’re helped by Friar Tuck (Tony Caunter), formally in the Abbot’s employ, but now a free agent. Caunter isn’t the rotund Tuck we usually see, but some of his other traits are present and correct (such as a love of wine). He’s also deeply argumentative and is clearly someone who won’t be pushed around. When Will tells him to kneel before Robin, his lord and master, Tuck indignantly replies that “I only ever bow to Christ, which annoys my so-called betters on earth profoundly.” After helping Robin to locate his pilfered possessions, Tuck disappears, but it’s certain we haven’t seen the last of him. Palace intrigue is a key part of this episode (and indeed the whole serial). The Queen Mother (Yvonne Mitchell) has returned and urges Richard to make John regent in his absence. Richard refuses (his choice is Longchamps) but he does grant John a portion of the kingdom to administrate (including Nottingham). Amongst Yvonne Mitchell’s key credits are the 1954 adaptation of Nineteen Eighty Four and the Out of the Unknown episode The Machine Stops. This isn’t a particularly taxing part, but she manages to portray the Queen’s icy detachment very effectively. The revelation that the Abbot, the Sheriff and Sir Guy are all involved in a plot to murder the King is another indication that this version of Robin Hood is, at present, more concerned with courtly intrigue than it is with the down-trodden and repressed Saxons. Robin learns of the plot and is eventually able to warn the King, but by then his unexplained absence has brought disfavour upon him. Richard has disinherited him as well as branding him an outlaw. 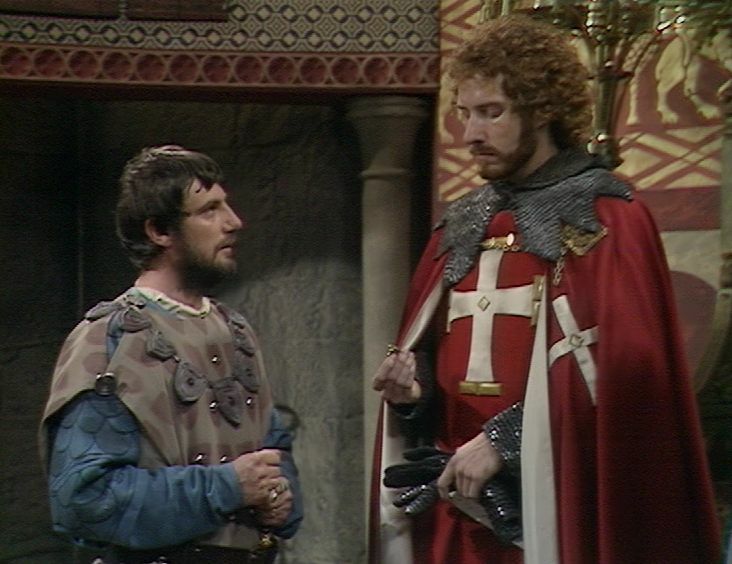 But in their final meeting, before Richard departs for the Crusades, he strongly implies that as an outlaw he’ll be able to stay in England and do some good. It’s slightly odd that on the one hand Richard makes him an outlaw and on the other seems to tacitly approve of him, but it means that all the pieces are now in place. Robin Hood, and his band of men, are outlaws and they face two implacable enemies – the Sheriff of Nottingham and Sir Guy of Gisborne. And since Richard has agreed to the marriage between Sir Guy and the Lady Marion, that provides yet another reason for conflict …..